If you’re looking to bring in the New Year making and bold and vibrant statement, consider using Radiant Orchid as the focal point in any room. 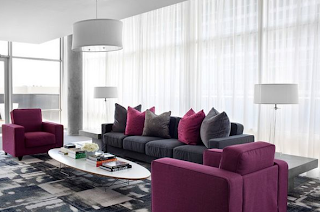 For the living room, try painting one wall Radiant Orchid and the rest a neutral color, such as gray or tan. Maybe add a few Radiant Orchid throw pillows or rugs as well! For your bedroom, go all out and have Radiant Orchid on the walls, the bedspread, the pillows, and the rug! When mixed with a few neutral colors, Radiant Orchid won’t be overdone. If you’re looking for more of a subtle look, bringing in Radiant Orchid will be the perfect pop of color for any room! For the living room, keep the walls neutral and add the Radiant Orchid to your pillows, blankets, lampshades, or rugs. 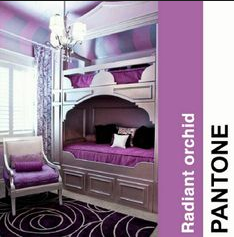 For your bedroom, keep the Radiant Orchid to your bedspread or rug only. Painting the walls a light or dark shade of gray will make your room trendy! For the dining room, leave the Radiant Orchid color to the chair upholstery, table centerpiece, or place mats. Radiant Orchid is sure to make a statement, whether bold or subtle, in your home in 2014. Utilizing this color will add a trendy touch to your home as well. For accent furniture to pair with Pantone’s color of 2014, check out our website!